This is a hearty main course soup which will please not only vegetarians. Carnivores could add some crumbled crisp bacon if desired. Heat olive oil in a large saucepan or stock pot, add onion and capsicum and cook for 4 minutes. Add garlic, Mexican chilli powder and ground cumin and cook, stirring occasionally, for an extra 3 minutes or until softened. Add tomato passata and vegetable stock and bring to the boil. Simmer for 5 minutes. Meanwhile make avocado salsa by combine-ining all ingredients and season to taste with salt and pepper. Add well drained kidney beans to soup and return to the boil. Add diced zucchini and cook for an additional 2 minutes or until the zucchini are tender. Season to taste with salt and pepper. Toast tortillas on char-grill if desired. 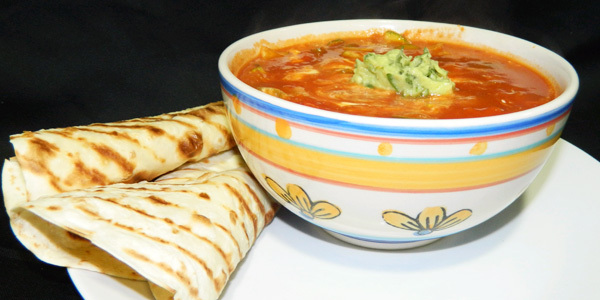 Serve soup in bowls topped with a spoonful of sour cream and a spoonful of avocado salsa. Lyndey’s Note: While kidney beans are traditional, you could substitute well-drained canned cannellini beans or even lentils if desired.